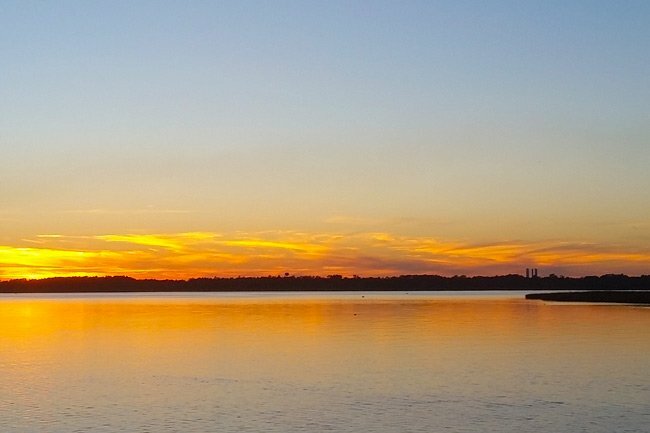 Today more than 16,000 acres comprise the pristine research reserve in Georgetown known as Hobcaw Barony. 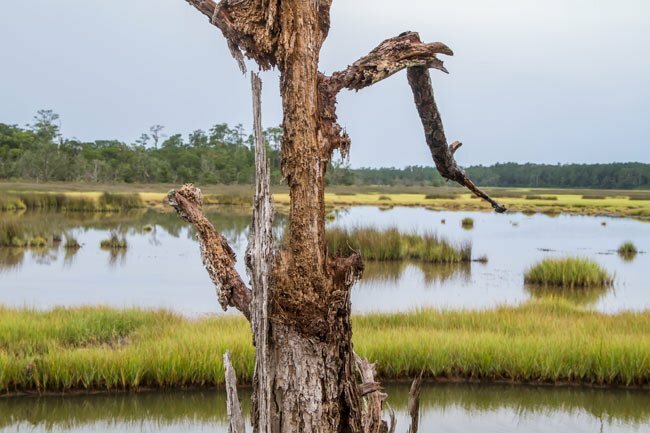 The native Waccamaws who originally inhabited the land called it “Hobcaw,” meaning “between the waters.” The name references its location between the Atlantic Ocean and Winyah Bay, shown below, which is in turn fed by several surrounding rivers. Although Lord Carteret was one of the eight Lords Proprietors, he remained in England, never venturing to Carolina, and sold the undeveloped property to John Roberts in 1730. Roberts had his land surveyed and discovered it actually amounted to 13,970 acres instead. Roberts later sold the land to three Englishmen – Sir William Baker, Nicholas Linwood, and Brice Fisher. Since these men resided in London, they appointed two agents to divide the barony and sell it. These smaller tracts were developed into the following plantations: Calais, Michau, Strawberry Hill, Friendfield, Marietta, Youngville, Bellefield, Oryzantia, Crab Hall, Alderly, Forlorn Hope, Rose Hill, and Clifton. In 1905 famed New York financier Bernard W. Baruch – originally of Camden – began purchasing most of the original “Hobcaw point” tract for use as a hunting reserve and winter retreat, along with several thousand acres of surrounding land. Baruch called his holdings Hobcaw Barony, which by definition means a tract of 12,000 acres or more. The portion where the main house now stands was previously Friendfield Plantation, which Baruch bought from the Donaldson Family. 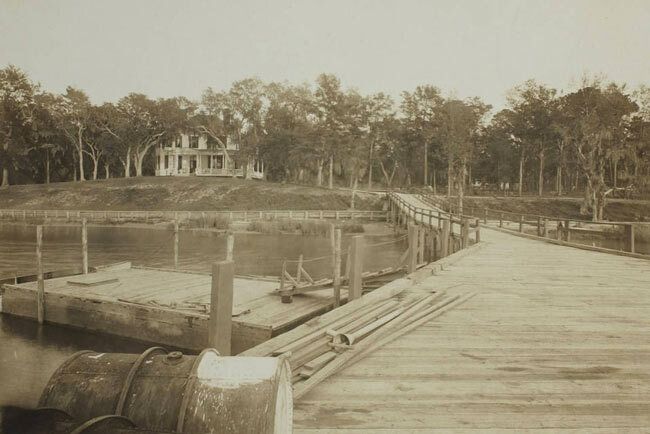 Hobcaw originally featured a traditional white clapboard home, built circa 1890, on the banks of Winyah Bay. It burned during the winter of 1929. Affectionately known as “Old Relick” [sic] by Baruch’s children, it was replaced in 1930 by the current brick manse, Hobcaw House, seen here. Baruch sought to make his new residence fireproof, and the bricks were manufactured in Cayce at Guignard’s Brickyard. Although Baruch never held an elected office, he advised several presidents, with President Woodrow Wilson (who himself had strong ties to South Carolina) appointing him chair of the War Industries Board in 1917. He was also widely known as America’s “Park Bench Statesman.” In addition to hosting numerous important figures at Hobcaw – including Winston Churchill and Franklin Roosevelt – he frequently held informal meetings with government officials at places such as Lafayette Square in Washington DC, located directly across from the White House. 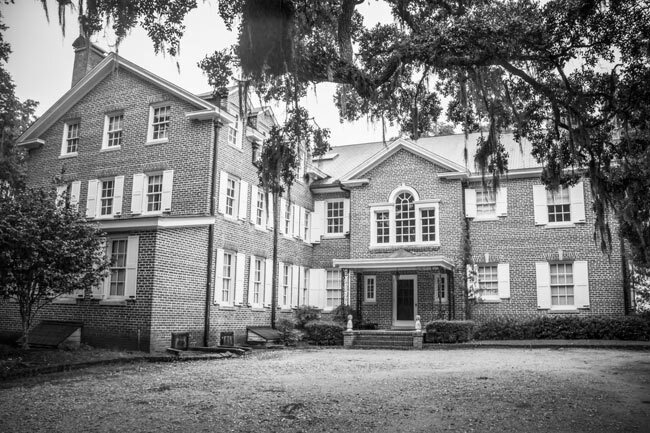 Baruch’s only son, Bernard, Jr., stayed in a suite on the bottom floor of Hobcaw House. FDR slept here during his monthlong stay in April 1944, one year before he died. Roosevelt, who had congestive heart failure by this time, was instructed by his doctors to sleep 12 hours a day. This serene space, with large windows overlooking Winyah Bay, originally held two twin beds, but the Baruchs commissioned a custom three-quarters bed for the president in hopes that he would be more comfortable, given his paralysis. (A three-quarters bed splits the difference between a single and full bed.) Baruch’s wife Annie also had a custom ivory candlewick spread made for him, and today one can still see the cigarette hole he burned in it. Baruch’s daughter Belle was an avid hunter and horsewoman, and in 1935 she began purchasing portions of her father’s property. By 1956, she owned all of Hobcaw Barony, which she managed for three decades prior to her death in 1964 from brain cancer. 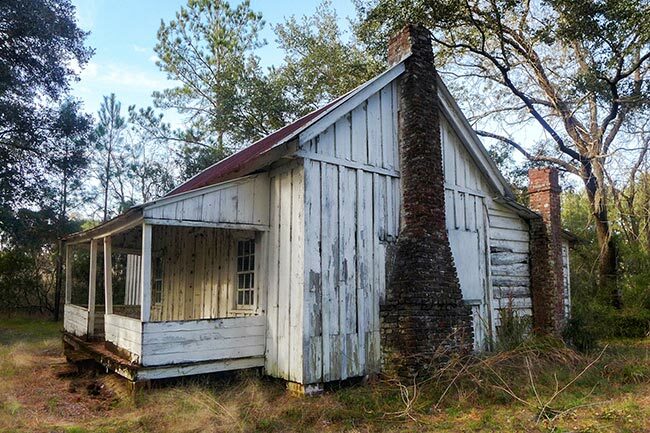 She left the property to a foundation to be preserved as an outdoor laboratory and research site to be used by schools and universities from South Carolina. Belle Baruch’s legacy continues through the Belle W. Baruch Research Foundation, which owns and manages the educational wildlife refuge. This quaint structure was the playhouse of Belle Baruch, built when the children on the plantation were small, around 1910. 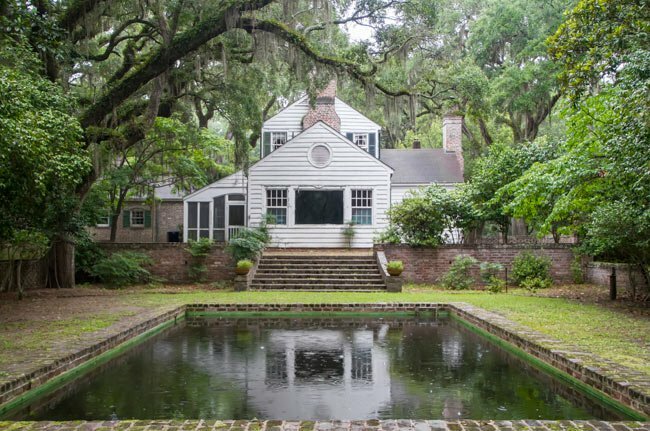 The cottage is frame with gable roof with a shed porch and exterior brick chimneys, it is located near the main house at Hobcaw separated by a paved and landscaped drive. Belle was also a dedicated equestrian, and not surprisingly, the gardens at Bellefield were created by landscape architect Umberto Innocenti, known for his designs at both Belmont Park and the Aqueduct Racetrack, among other notable sites. In South Carolina, Innocenti’s work includes Bonnie Doone in Walterboro, Joye Cottage in Aiken, and Harietta Plantation near Charleston. The brickwork at Bellefield was taken from the Charleston Academy of Music, which was demolished in 1936. The recycled bricks give the home an antiquated appearance, similar to that of nearby Arcadia Plantation. Belle was active during World War I in the Women’s Radio Corps teaching women Morse code. During this period she also advocated for female suffrage. Following the war, she traveled the world as a representative of the League of Nations Non-Partisan Association. A woman of many passions, her greatest love was horses. Belle lived in Paris with her father from 1919 through much of the 1930s, where she built a stable and earned 300 medals for her riding. She dreamed of competing in the Olympics but was prevented by her gender. 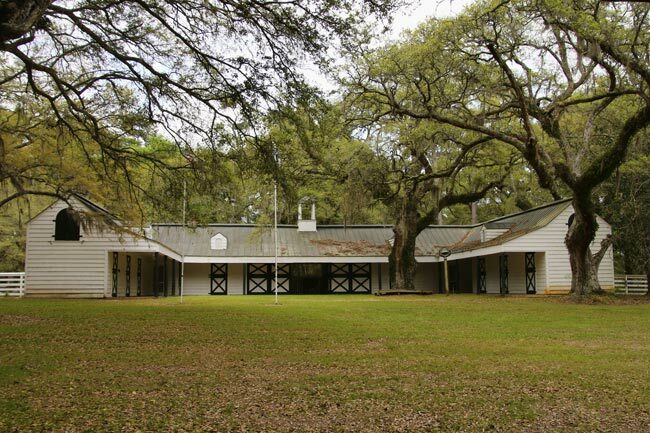 Back in South Carolina, she personally oversaw the construction of the stable shown below, which was completed the same year as her Bellefield house. Belle’s most beloved companion was her faithful friend, Souriant III, is buried here. The name Souriant meant Smiling One, he was bred as an Anglo-Arab, half-Arabian and half-thoroughbred. Souriant was trained by Jean Darthez. Souriant would win her many awards but one victory is particularly worth mentioning. Prior to World War II, Baruch competed all over the world but while in Aachen, Germany, she competed against Adolph Hitler, and won. Hitler tried to buy the horse from Baruch but she refused. 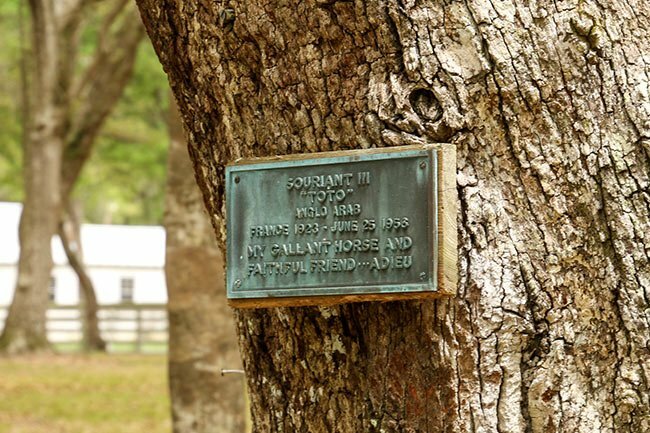 This marker marks the final resting place of her beloved racehorse and friend and is commemorated with a plaque, the plaque is on an oak within view of the house so she could see him at all times. Although Belle was an exceptional hunter, she later came to renounce the sport, at least in part, and devoted herself to conservation. Noting the steep decline of ducks, wild turkeys, and other species at Hobcaw, she hired Nolan Taylor, a trained forester, to manage the estate and help protect native wildlife populations. Belle also used airplanes to survey her property and catch poachers. Belle learned to fly in 1939 and purchased this hangar from Walker P. Inman, nephew of Doris Duke and owner of nearby Greenfield Plantation to keep her plane. 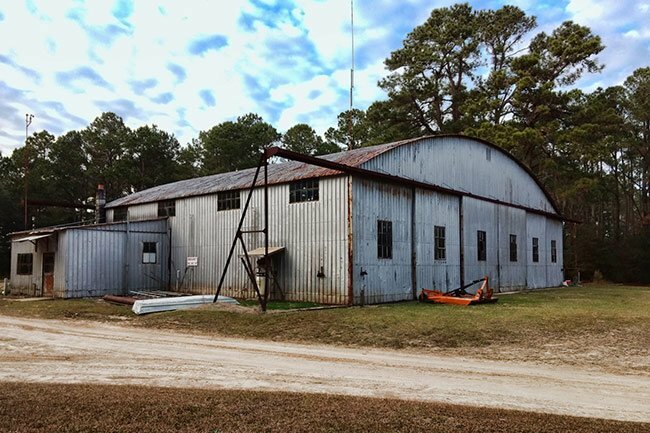 She initially rented space at the Georgetown Airport on Merriman Road but during World War II, the Army Air Corps confiscated the hangar and her two planes. When the war was over, Belle was able to recover her hangar, had it dismantled and re-erected at Bellefield. The hangar stands adjacent to her private 1500 ft runway that she used to fly in and out of until her death in 1964. 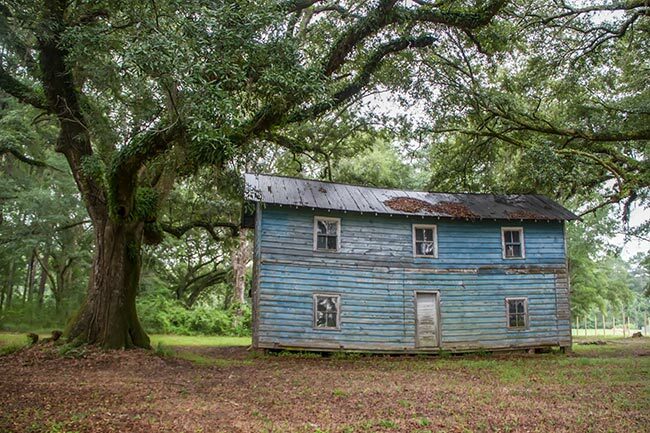 This two story blue house stands in disrepair amidst a grove of large live oaks. 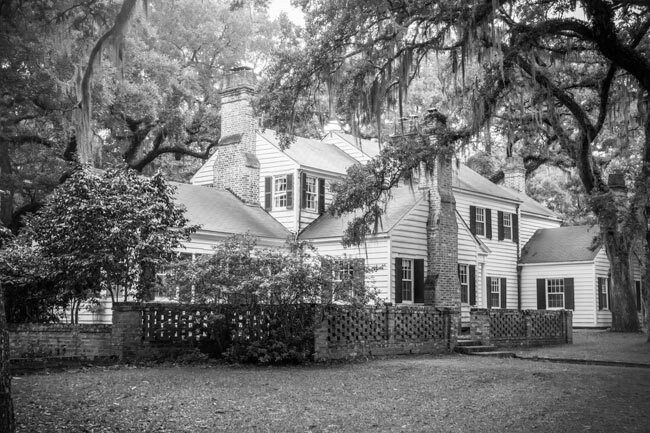 The house once served as the home to Joseph J. Vereen, superintendent of the woods at Bellefield Plantation. This cabin was once part of the original Oryzantia slave village. 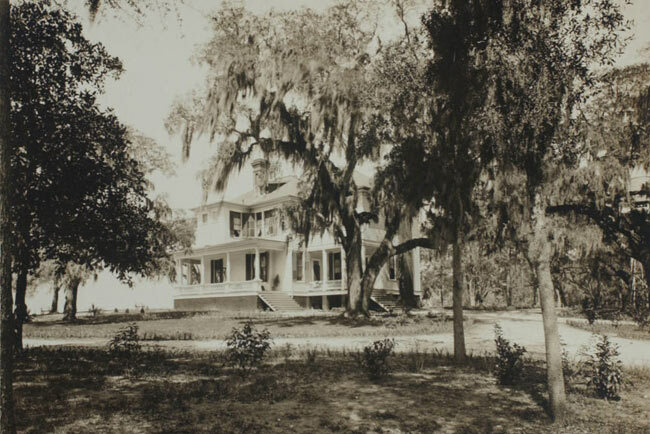 Later it served as the home for plantation manager Nolan Taylor’s father. Taylor’s father oversaw the gardens of Alderley Plantation which was another one of the tracts of land pieced together to form Hobcaw. 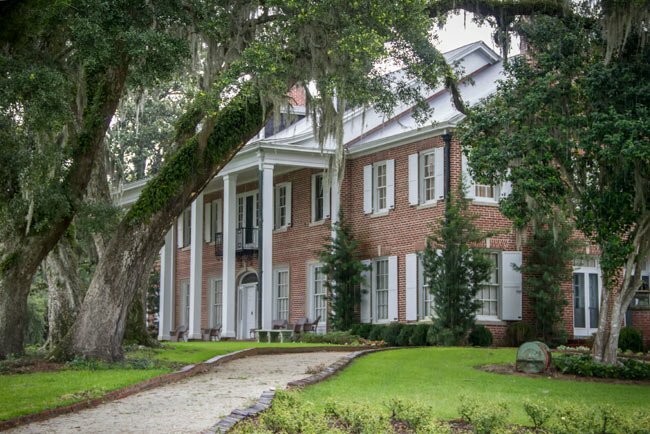 When Bernard Baruch bought Hobcaw in 1905, many former slaves from Friendfield Plantation remained on the property. 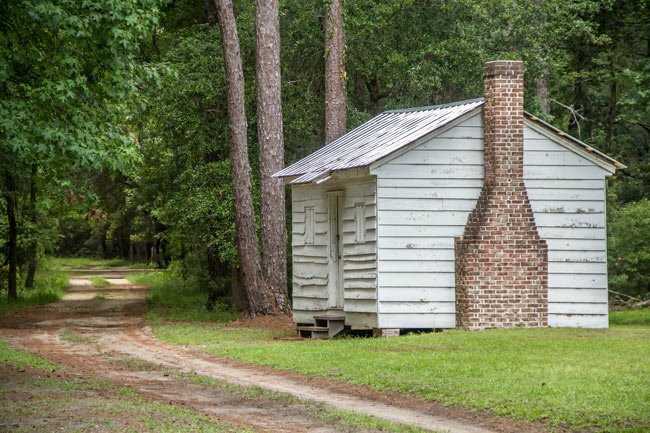 Like his predecessors, Baruch allowed them to stay as employees; to some extent, he also updated the primitive cabins in which they lived. These had not seen substantial changes since before the Civil War. 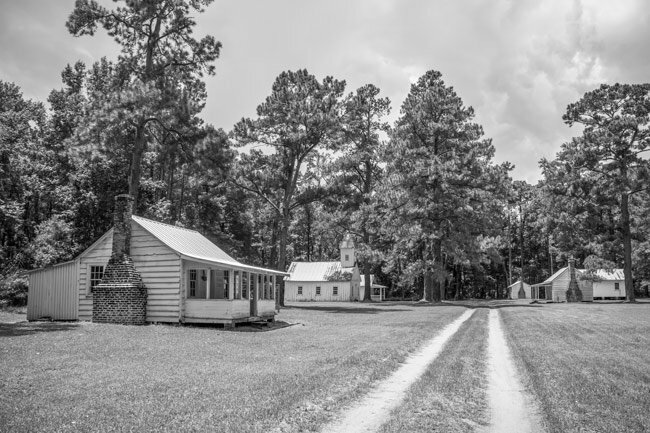 It is important to note, however, that these miniature homes continued to lack even the most basic comforts, especially compared to Hobcaw House. 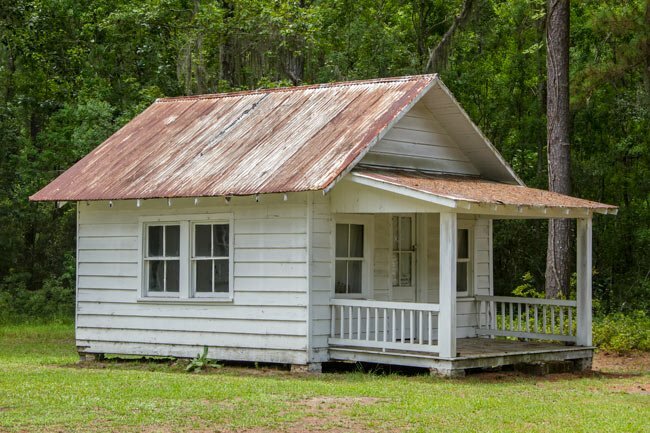 As many as eight family members shared the cabins, and indoor plumbing did not exist in the villages into the 1950s. The families were forced to use the Baruch’s discarded magazine and newspaper clippings to seal gaps in their walls. 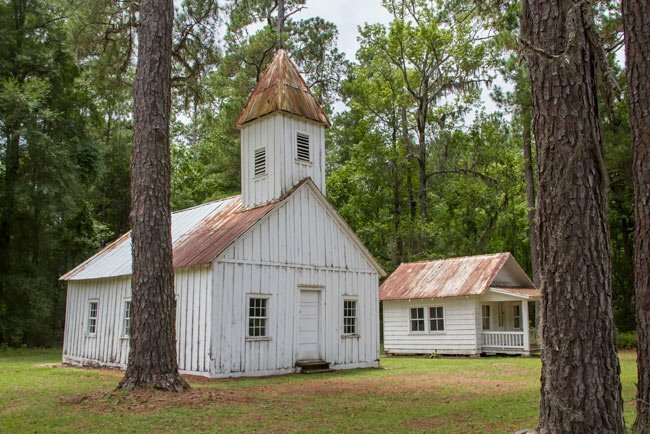 There were several communities inhabited by African-Americans at Hobcaw, among them Friendfield Village, Barnyard Village, Alderly Village, and Strawberry Village. The first two were located on what was known, prior to Baruch’s purchase and the reassembly of the barony, as Friendfield Plantation. 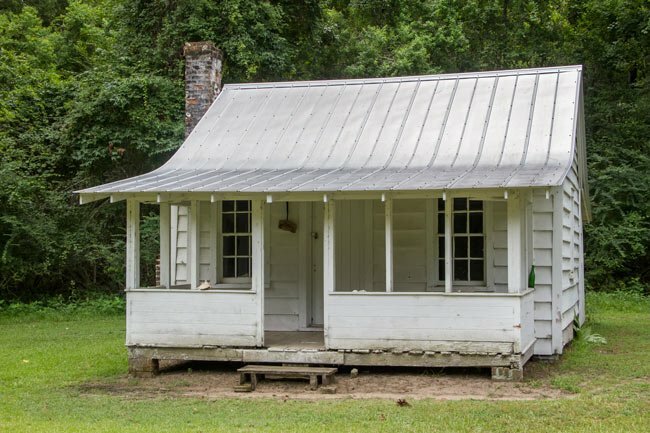 Confiscated during the Civil War by the Freedmen’s Bureau, former owner William Algernon Alston successfully petitioned the federal government for his property’s return. Alston died a year later, in 1886, and it then passed to his cousin, Thomas Pinckney Alston, Jr. The interior of the Friendfield Village church, seen below, is proud and unrefined. Light floods through the narrow windows shining brightly on the pulpit. Residents of the village gathered here for worship services but the church served as a heart to the community. In 1874, Hardy Solomon bought Friendfield at a public sale. Included in the sale were Calais, Marietta, Michau, and Strawberry Hill plantations, all of which once belonged to the Alston family. Solomon in turn sold the land to Eliza and Robert Donaldson, born in England and Ireland respectively, who applied the name Friendfield to the entire estate. The Donaldsons owned Friendfield from 1875 until 1905. Both Bernard and later Belle were known for their paternalism. 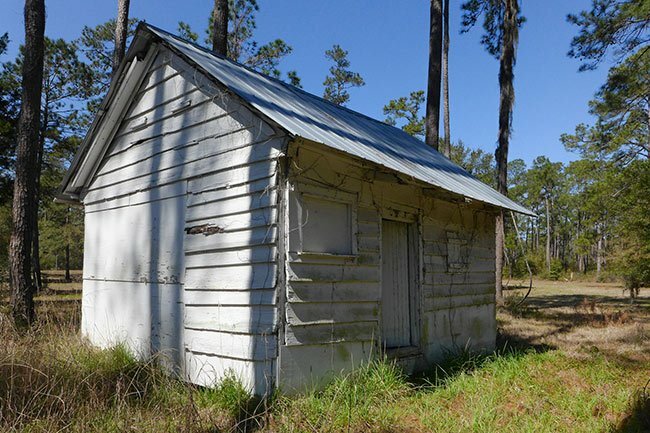 Although they provided for Hobcaw’s black residents in some regards, they paid them low wages and most moved away once Hobcaw was connected to the mainland by a bridge over Winyah Bay in 1937. By the 1950s, Friendfield Village had been abandoned. 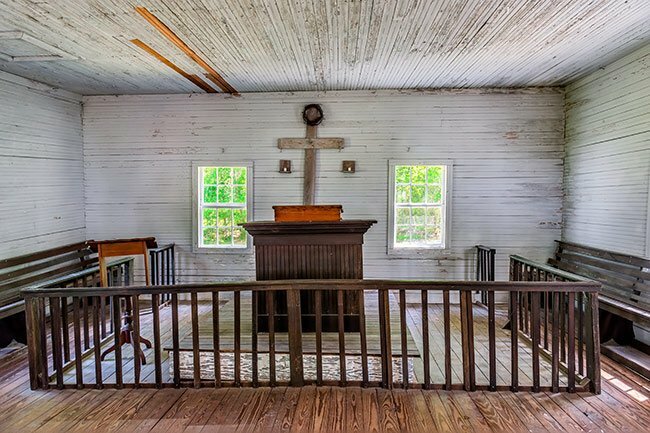 The Baruchs restored a chapel that had served Friendfield Plantation and was still in use as an African-American church. Friendfield Village also included a one-room school which educated black students through fourth grade. Hobcaw maintained a separate school for children of its white employees. The white schoolhouse, shown below, was later moved to Friendfield Village to function as a medical dispensary. 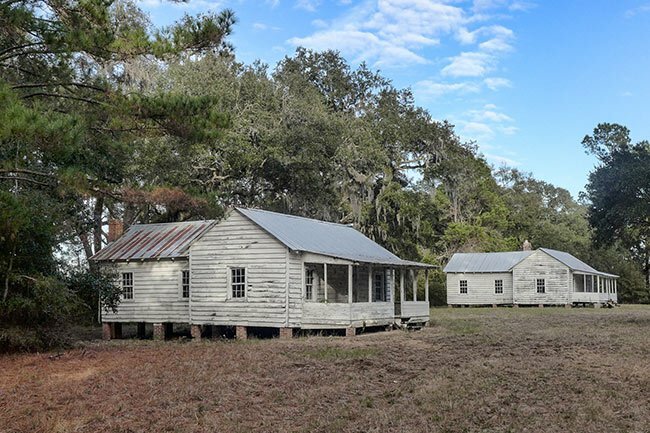 Three houses remain in Barnyard Village, another historic settlement on the former Friendfield Plantation at Hobcaw Barony. Originally granted by King George of England to John Carteet in 1718, Friendfield Plantation had several historic African-American settlements as noted above. 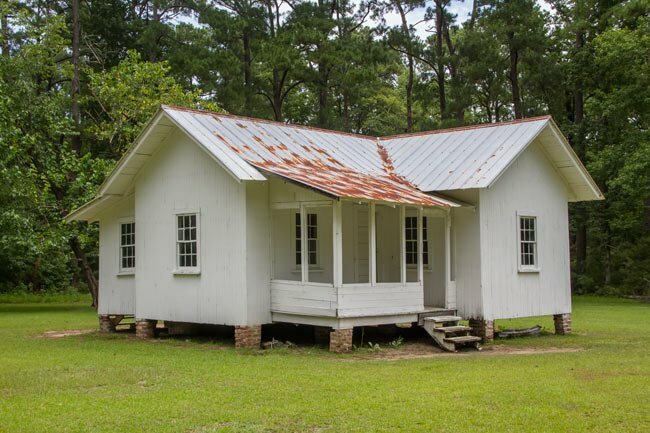 Originally, Barnyard Village consisted of 16 cabins used for enslaved people ranging from rice mill workers, mechanics, blacksmiths, coopers and carpenters. During the Civil War, the plantation was confiscated under the Abandoned Lands Act, as many were at that time. The property was returned to the owners after the war and a short time after, several properties such as Strawberry Hill, Calais and Michau were all combined into Friendfield. Several of these buildings were built and modified around 1925 by African-American employees of Bernard Baruch. Descendants of the formerly enslaved continued to live in Barnyard Village until the 1940s. Mr. Robert McClary who once lived Friendfield Village also lived here at Barnyard at one time. A video of his time at Hobcaw Barony can be found on their website. The Friendfield Plantation rice mill, seen below, may be in ruins now but was once part of a thriving rice operation. 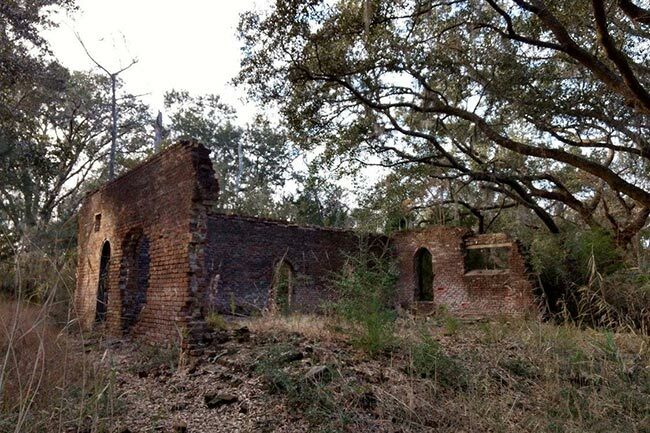 (Bellefield Plantation) Hobcaw Barony is a 15,680-acre tract that includes buildings, structures, landscape features and sites associated with the continuing use of the land from ca. 1730 until 1943. Individual components, such as buildings, roadways, cemeteries, canals and embankments, reflect the use of the property over time. They illustrate the evolution of lower Waccamaw Neck from the development of rice plantations, through the antebellum period of concentrated rice cultivation, to the post-Civil War conversion of former plantations to winter resorts where natural and cultural landscapes were conserved for duckhunting and entertainment. Hobcaw House was built in 1930, and retains a high degree of integrity of design, materials, and workmanship throughout. Its architecture is a good example of the popular Colonial Revival influence that was supplanting the rustic style of earlier hunting club lodges. The house was designed by the Columbia firm Lafaye and Lafaye. 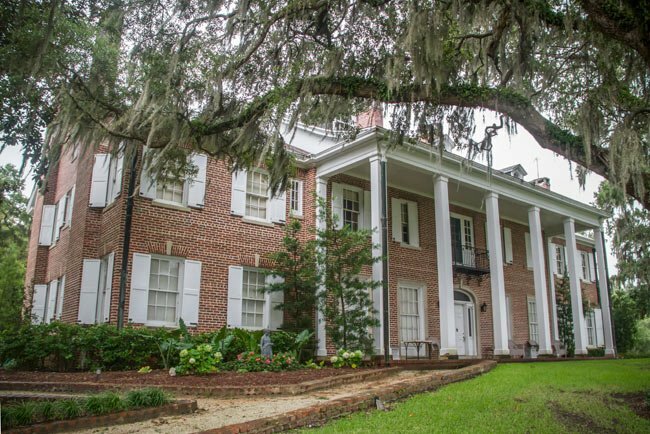 Designs of buildings and landscaping at the Hobcaw House and the Bellefield House complexes are typical of properties that were constructed or reused by hunting plantation owners for themselves and their employees. The entire site includes 42 contributing buildings, 53 contributing sites, and 25 contributing structures. 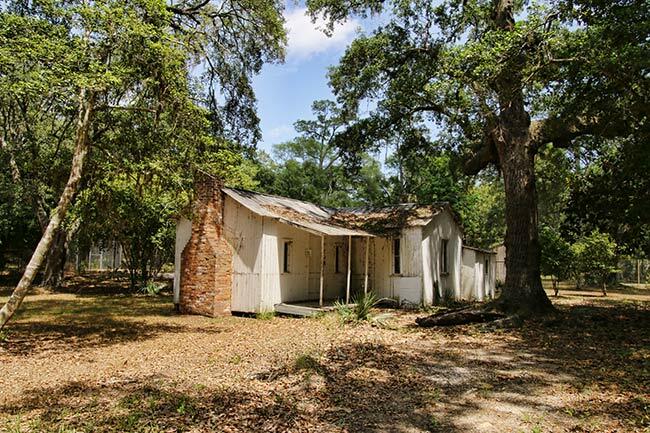 Numerous outbuildings include such examples as various barns, pumphouses, various sheds, cottages, slave settlements/cabins, and a church. 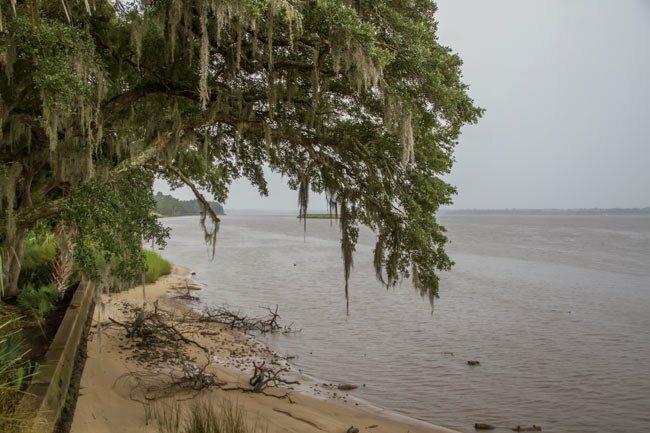 The source of the name lies in the 1718 royal grant to John, Lord Carteret, a “barony” of 12, 000 acres on the southern portion of Waccamaw Neck, called Hobcaw Point. Between 1766 and 1767 the property was surveyed, divided, and sold as several parcels. There is an excellent interactive guide to Hobcaw’s past and present at BetweentheWaters.org. It was created by SCETV and includes interviews with former residents as well as Baruch family home videos filed at Hobcaw. “I consider it a privilege when I am a guest visiting a historic home where owners once lived during a different lifetime. These are pictures from Bellefield, built in 1937. I visited today and had the opportunity to see two floors and the fallout shelter below, and the beautiful stables. 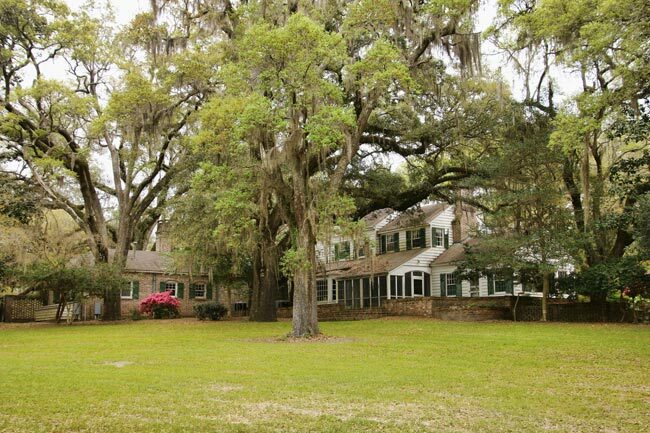 Bellefield Plantation was the name of the original plantation on what is today known as Hobcaw Barony. Belle Baruch had the house built over the foundation of the original home and kept the name. “She had the stables built when she returned home from France because she wanted it done her way. She returned home after living 16 years in France because her father warned her of the threat of war. Belle was a sportsman, a sharpshooter, a horseman, and a pilot. She loved her home and wanted to be buried there. Unfortunately she died a year before her father and he had her buried in NY. Her prize winning Arab, Souriant III, lived into his 30s and is buried on the property. Many of her dogs were also buried there. Thank you for helping us spread the word about Hobcaw Barony. 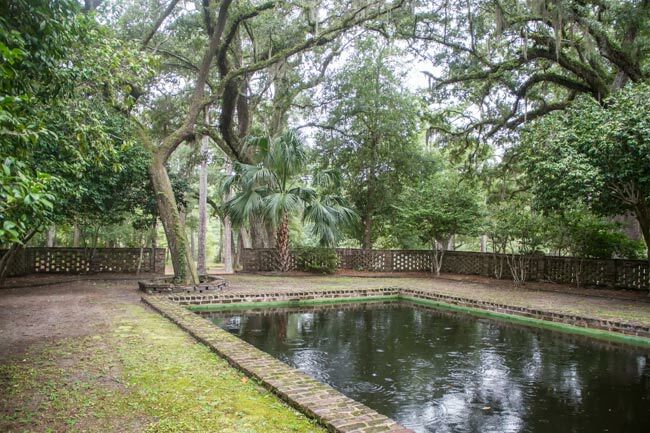 This “private property with public programs” offers visitors and researchers great resources for lowcountry history and it is a privilege to work here. We’ve just announced a new Belle W. Baruch Institute for SC Studies to study the humanities – Native People, African Americans, archaeology, religion, women, textiles, music, culinary history, etc. Come visit and thank you for this wonderful support.